We expect Eqs. (253) and (254) to support wave-like solutions which bounce backwards and forwards between the conducting walls. For all values of , the two roots of the above quadratic are complex, but have modulus unity: i.e., . This implies that our differencing scheme is both numerically stable (if then the scheme would be unstable, since the associated eigenfunction would be amplified at each time-step) and non-dispersive (if then all Fourier harmonics would eventually decay away, and, hence, so would the solution). Note that the above calculation is equivalent to von Neumann stability analysis. The routine listed below solves the 1-d wave equation using the Crank-Nicholson scheme discussed above. The routine first Fourier transforms and , takes a time-step using Eqs. (263) and (264), and then reconstructs and via an inverse Fourier transform. // in region 0 < z < L.
// Arrays Ex, Hy assumed to be of extent I+1. // Also, D = pi c dt / (2 L), where dt is time-step. and the calculation is performed with , , , and . It can be seen that the pulse moves to the right, reflects off the conducting wall at , and then moves to the left. Note, that when the wave is far from the conducting walls and moving to the right, whereas when the wave is far from the conducting walls and moving to the left. 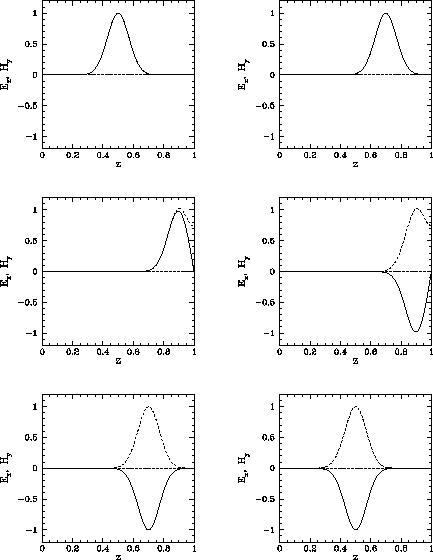 Figure 80: Propagation of a 1-d Gaussian wave-pulse. Numerical calculation performed using , , and . 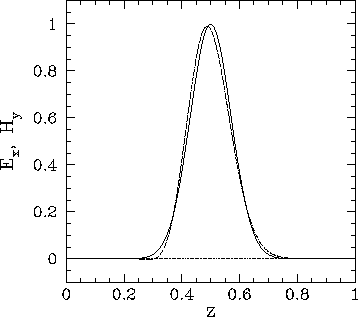 The solid curves show , whereas the dashed curves show . The top-left, top-right, middle-left, middle-right, bottom-left, and bottom-right panels show the solution at , , , , , and , respectively. Figure 253 shows a second example calculation performed with the same parameters as the first. In this calculation, the pulse is allowed to reflect off the conducting walls ten times before returning to its initial position. 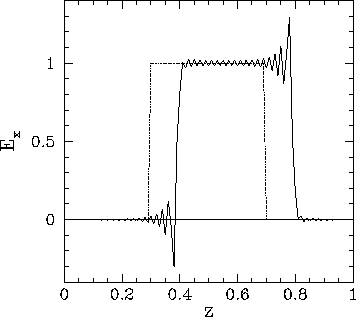 Note that the pulse amplitude and shape remain constant to a very good approximation during this process. The fact that the pulse returns almost exactly to its initial position after ten time periods have elapsed (i.e., at ) demonstrates that it is propagating at the correct speed (i.e., ). and also tend to be highly dispersive. Figure 82: Propagation of a 1-d square wave-pulse. Numerical calculation performed using , , and . The dotted curve shows at , and the solid curve shows at .